Welcome to the Taconic Hiking Club in the Albany, NY Capital District/Berkshires: Lapland Lake Reports Good XC Conditions!!! We have all trails open (except skiing directly on Woods Lake). It looks like great weather ahead! 47km of trails are open. 35km of trails are snowcat groomed with trackset and skating lanes. Surface is a power-tilled mixture of loose and frozen granular. 12km of pristine trails are also open for snowshoeing. 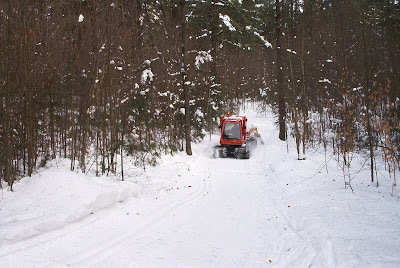 Our compacted base is over 3 feet with more than 3-1/2 feet of snow in the woods. We have received nearly 12 feet of snow so far this season!